Amaranthine Flowers By Design offers you this colourful arrangement in oranges, reds and yellows, with long lasting natives, yellow gerberas, berries and seasonal blooms in a bowl. 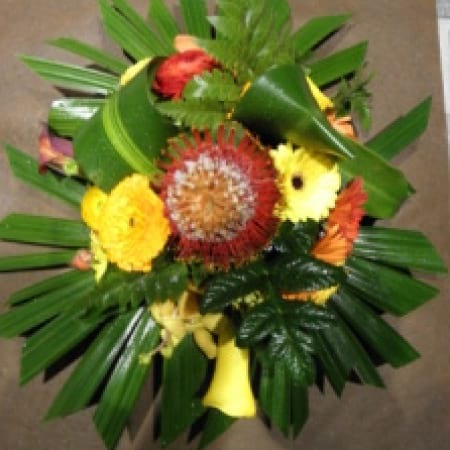 The Autumn Bowl Arrangement is a unique design that will look gorgeous, adding a special touch to any room and make a fabulous gift to friends, family or business to business to say congratulations, thinking of you, just because or Merry Christmas. The Amaranthine Flowers By Design Arrangements are a beautiful way to say it all. Same day delivery available to all areas of Newcastle and Lake Macquarie, including John Hunter Hospital, Newcastle Private Hospital, Lake Macquarie Private Hospital, and Mater Hospital.